There was a time that the concept of a ‘Smart City’ was purely science fiction. We may not have flying cars yet, but we have promising research and functioning prototypes of self-driven cars, smart homes; we even have AI based systems available at our fingertips to assist us with day to day tasks. The latest news in the IT industry is that the Canadian Government is collaborating with a leading IT company to design a district in Toronto’s Eastern industrial waterfront. Initial plans describe vehicles that will be autonomous and robots who roam underground executing menial tasks like delivering mail. The deciding factor on how soon we achieve solutions for these challenges reside on the shoulders of the future generation. The world needs innovative young minds with strong technical skills who think outside the box. This means that those entering the IT industry over the next few years will have big shoes to fill. BCS Higher Education Qualifications provide you with the skills and knowledge required to succeed in a career in IT. Simultaneously, the Higher Education Qualifications put you on the path to obtain Chartered status; A global benchmark for IT that enhances your career prospects and recognises you as an IT professional belonging to an internationally accepted Chartered body. BCS connects you with the industry globally! The qualifications are built upon three levels that can be completed via flexible and affordable study options. To gain the full qualification, all three levels must be completed. But, anyone who wants to divert their careers to another field can exit at any qualification level and come back to continue their qualification later. Candidates start at the Certificate in IT which delivers concrete knowledge essential for any budding IT professional through three compulsory modules. Upon successful completion of the Certificate in IT, one can proceed to BCS Associate (AMBCS) membership. The next level known as the Diploma in IT consists of one core module and three elective modules. BCS offers subjects like Database Systems, Computer Networks, IT Project Management, Software Engineering and Principles of User Interface Design, out of which you must select elective modules. 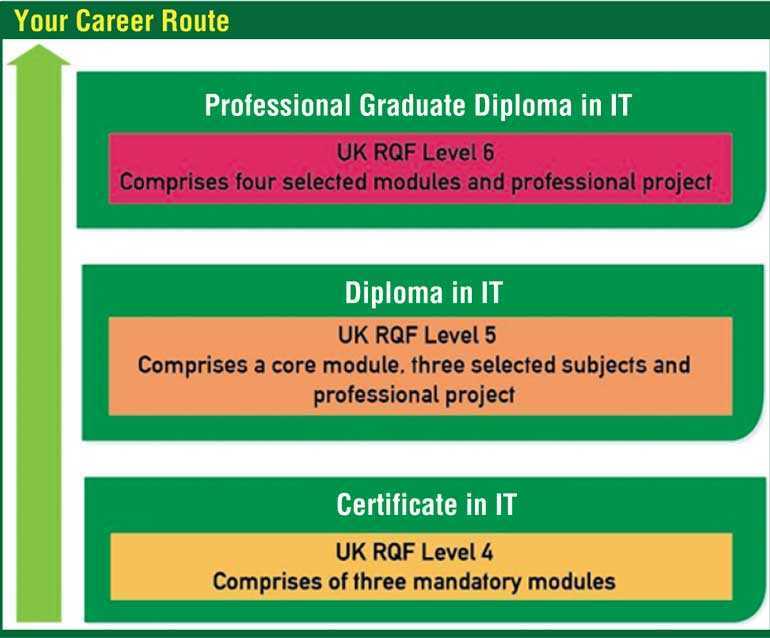 Students must also complete a professional IT project in order to complete the Diploma in IT, which is the academic equivalent to a UK undergraduate degree at level 5. The Professional Graduate Diploma in IT (PGD) is the topmost level of the BCS Higher Education Qualifications hierarchy. The PGD is the academic equivalent of a UK undergraduate degree program and consists of four modules along with a professional IT project. All modules offered at this level are electives. Advanced Database Management Systems, Knowledge Based Systems, Network Information Systems, Programming Paradigms, and Web Engineering are some of the subjects offered at this level to allow students to select the areas that suit their chosen career path. Successful completion of the Professional Graduate Diploma in IT, UK academic level 6, makes you eligible to apply for the Professional membership of BCS (MBCS). The pioneering professional body in the IT industry, BCS, celebrated its 60th anniversary in 2017. Committed towards making IT good for society, the institute does so by setting standards and frameworks, nurturing relationships between professionals, academics and businesses, fostering new thinking and supporting practitioners in continuous professional development via training, certifications and membership. Registrations for September 2019 BCS examination are now open! To obtain a list of all the BCS approved Course Providers found in several main cities across the country visit the BCS website. For further information and details on enrolment contact BCS Sri Lanka on 011 2 698 566 or customerserviceslk@bcs.uk. To learn more about BCS and the other products offered by the institute, visit www.bcs.org.